The Stairs and Rails were Stained. Since our hardwood stairs and railing arrived without being stained, the painters returned to add several coats of floor matching stain, followed by several coats of polyurethane to protect the wood. Staining unfinished wood shall best be done by skilled people/professionals; however, if one decides to do this on his or her own, making sure staining is done correctly is a must. The staining process does not only involve staining per se, several other steps need to be undergone to ensure a properly carried out staining process. The basic tools and materials needed for staining include sanding paper, stain, a foam or brush, and wood finish. In addition to all that, safety gloves, glasses, and a mask can be used for protection while working on site. Old clothes can be worn while working with the stain as it may leave permanent marks on any surface. This is particularly true for an oil-based stain. Another important part of preparation is identifying whether the wood is hard or soft. If the wood has blotchy patches and patterns or the wood's grain is uneven, it is more than likely a soft wood. It is crucial to condition a soft wood before staining as it aids with the even application of the stain afterwards. This process is done after the wood has been sanded. On the contrary, hardwood typically has consistency with the grain and pattern, and does not deem conditioning necessary. Although, hardwood may require more stain coating than softwood. Sanding prepares the wood for staining. It mainly helps keep the wood smooth but it also gets rid of imperfections and unevenness on the surface. It also plays a very significant role on the staining process because it will absolutely have an effect on the final appearance of the wood. When sanding is poorly executed, the effects will still be visible even after the application of stain. This will only bring forth disappointment and may render all the work futile, especially if one is striving for perfection. The level of smoothness of the surface can be determined with the grit of the sandpaper; keeping in mind that sandpaper with higher grit creates a smoother surface. Lower grit sandpaper, relatively, makes the surface less smooth. Wood with a smoother surface absorbs less stain. This may affect the darkness or lightness of the stain when applied. After sanding, clean the wood surface for any dust and fragments with a slightly damp cloth. This will remove any debris from the wood and avoid fragments getting caught in the stain. To begin the staining process, make sure the can of stain is stirred well to bring out its real color. It is a good test to find a scrap piece of the same wood and try the stain out on it. This will give you a pretty good idea of what the wood will look like once stained, and will also allow experimentation with the amount of sanding and the number of coatings. It is better to apply less stain and reapply when needed, than to do it excessively at once. The actual staining process shall begin. Using a brush, sponge or foam brush, carefully apply stain on the wood. Make sure to go with the grain of wood, and at the same time, ensuring that no bubbles appear. Apply as many coatings until satisfied and then let the stain set. Leaving it to set longer will cause a darker color so wiping and cleaning off the surface with a cloth for excess stain can be done anytime as desired. 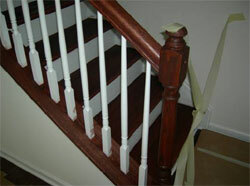 To provide the stained wood a finish as well as protection, polyurethane can be used. Apply the polyurethane the same way as the stain. Carefully, bearing in mind that finishing is the final step of the process and will have a significant visual effect on the wood. Finish can be reapplied for a thicker coat. Safely place the wood in a well-ventilated (if possible) area and leave the wood to dry. If the wood is already in place, make sure to properly ventilate the area. Now that you know the ins and outs of staining unfinished wood, your project should go much smoother.